ince Windows 8’s official launch to the market we received a lot of devices that run this platform, however we haven’t had an Acer machine. This will be corrected right away and in a very elegant way, in this video review DigitalMagnet presents the white jewel Acer Aspire S7. This slim and sleek design is what amazes the eye. Design is where this machine excels, but just a hint, it’s not the only cool thing it has to offer, it’s one of the many. The 13.3’’ display is a FullHD IPS capacitive touch-screen one. The screen of the Aspire S7 features the new White Gorilla Glass 2 technology that protects from scratches not only your touch screen display but the aluminum case as well. If you need a highly portable machine that is just as powerful you will probably choose the 11.6’’ model of the Acer S7, which gives you the freedom to go just anywhere. This is white elegance, power and portability all in one place. This ultrabook’s most distinctive feature is the 180 degree opening angle. It can be easily laid flat and used from both sides which in combination with the sensor display make it perfect for teamwork. This is also possible thanks to the wide viewing angle of 85 degrees.The hard drive type is of Solid-state type in a RAID 0 configuration and is available in two storage versions a 128GB and a 256GB one. The hard drive interface is SATA III. 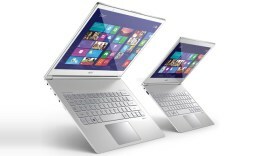 The platform on this elegant ultrabook is, as you probably have already guessed, Windows 8. The much more flexible tab panel interface of this platform provides one-touch access to all of the apps and controls. What is worth pointing out is that it is the full Windows 8 platform, not the Windows RT version. The operating memory on board is 4GB of DDR3. For the processor you can chose between IntelCore i5 and i7 where you get 2 x1.9GHz frequency. However, Turbo Boost 2.0 can push it up to 3GHz for each core. The graphics are provided by the hardware element Intel HD 4000. It results is a good visual performance with sharp detail and rich colors at the contrast ratio of 500:1. The special Acer TwinAir cooling system features special technology that makes the cooling process effective and this ultrabook will never overhear no matter what kind of software you run. No more worries while using the computer on your lap. The case features two fans, one fan pulls air in and another independent one pushes the warm air out. The intuitive backlit keyboard auto-illuminates to provide the perfect glow in dim light conditions. Batterylife is where this model receives less points. The 4-cell 4680 mAh Li-Ion battery didn’t perform as good as we expected, the intensive internet browsing on Wi-Fi drained the battery in 3 and a half hours. In idle mode the battery can make it for 6 and a half hours. To increase the unplugged work time from Acer offer a second battery. The periphery provides the most commonly used ports: 2 USB 3.0, one micrоHDMI port. You will also find 2 in 1 card reader that supports both SD memory cards and MultiMedia Card. The weight corresponds perfectly to the compact size – only 2.9lbs.